When it comes to Android one advantage over iOS is the ability to sideload applications as well as browse the files stored on your device and the ability to open various file types such as .zip files, pdf files, .rar files and many others. However if you have ever gone to the Google playstore you will see a massive selection of file managers, in this article we take a look at some of the best file managers and how they stack up against each other to see what features you may need to choose the perfect file manager for your Android device. 1. Astro File Manager: This application is one of the oldest file managers around and I can still remember using way back in 2012 on my old galaxy ace, this application has since being updated and is frequently maintained with a much smoother interface and compatibility with the current Android 6.0 marshmallow. This application has a somewhat simplistic UI and is very feature rich. Swiping over from the side you have toggles to access files on internal & external storage. Along with this you can also add a Dropbox, box.net, Facebook, Microsoft Onedrive or even a Google Drive account and access their contents within the app. Personally I found this a little pointless since I already have the Google Drive app and the Dropbox app, although if you don’t like having multiple apps and just want a single one to manage your files than this is a perfect solution. The application is capable of handling zip files, PDF files, apk files, various images & videos and also other files. Alongside this you can also browse network shares on a LAN network from Windows, Mac and Linux computers, furthermore a task killer and backup feature is included although from experience the task killer is not very effective and backup program limited in functionality. If you want a task killer and backup software I recommended trying alternative software which includes more functionality. 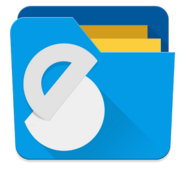 All in all a great reputable file manager for keeping everything in one app and definitely worth looking at for those new to Android. 2. Next on the list is ES File Explorer which is my personal favourite file manager, like Astro this file manager has evolved greatly over the years and is well maintained by it’s developers. It has a beatiful interface with material design like icons and is very simple and fast to navigate. The application supports pdf, apk, image & video as well a range of archives such as zip files, rar files and 7z compressed files, you can also preview the contents of an archive and then choose to extract it in a folder or directly to the current location. ES file explorer is very light weight and from my experience seems to load faster than Astro and works smoother as a result. Despite being simplistic you won’t be limited with functionality here ES file explorer is a powerful app with many other capabilities, you can set up cloud storage accounts and access their files within the app but also connect to your FTP server or access network shares on a LAN network. ES file explorer also includes a handy disk analysis function to find what’s taking up space on your phone so you can free up space if needed. All in a great app with loads of features and powerful features which also allow streaming options, file encryption and media management, a must have app for Android and in my opinion the best basic and intermediate featured file manager. 3. Solid explorer is another great app worth looking into, this app features a stunning material design theme which mimics the Android 5.0 lollipop layout. Once again this app includes support for all the major cloud platforms with the addition of Yendex a popular Russian company as well as owncloud servers you may have set up. Solid explorer also features an inbuilt root explorer which allows rooted users to access and or modify system files. You are also presented with a wealth of other handy tools such as batch copy/rename, support for zip,tar,rar and 7z files even if encrypted, FTP/SFTP,WebDav, SMB & CIFS shares. In addition you can change the view to horizontal and have a double sized pane to move files between different locations by long pressing a file and moving it with your finger to another location. Alongside this you also have options for different icon sets, chromecast support, file hiding and a media explorer makes this app a great choice for Android users. 4. Last on the list is Total commander and is free on the Google Play store, you may have heard of this app since a PC version has existed for many years for Windows and even dates back to Windows 3.1. Such a old file manager is still going strong over the years and provides a vast selection of tools in it’s feature rich app. Like the others you have support for different archives, documents, pictures & videos and Android apk files. Props to the developers for such a great app and a dedicated team to maintain it, everything works as expected and is filled with a wide array of functionality. The app supports the following: FTP, SFTP,Bluetooth, LAN access, WebDav, image thumbnails,bookmarks, cloud support, internal & external storage,material design,file compression,built in text editor and of course WLAN transfers. The interface is a little complicated for new users but it provides the advanced functionality of a true robust file explorer with the features to support dual pane file copying. Like it’s counterpart Solid explorer Total commander has a strong focus on plugins to add more features that you may need, both development teams other extra plugins and a pro version for extra functionality. When it comes to a file manager you can always use the default one that comes with your phone by the OEM or ROM developer however when extra features are needed 3rd party ones are necessary to truly give you control over your files. Hopefully this article shed some light on file managers and helped you choose one for your Android experience. If you have any other preferences feel free to let me know in the comments section of the site and let me know what you use to manage your files. Great site, stay with it! Also, i appreciate you permitting me to comment! an effort for his site, as here every information is quality based information. hey man as for WordPress you can get by without knowing HTML code although it can help especially if you want to design custom parts or edit particular pages. I would recommend to learn some because it does come in handy at times. Hope this helps. hi there thanks for the support if you would like to follow me on Twitter use the buttons below the page and you can view the Twitter page. hello I totally understand your frustration, I will be doing a complete write-up on security soon which will have some good plugins to help you out! Best wishes! Just where will be the contact details though? Hello glad you enjoyed the content, if you would like to contact me please use the contact page located at the top of the site. piece of writing presents pleasant understanding even. along with the other parts of the website is extremely good. I each and every time spent my half an hour to see this weblog’s articles everyday in addition to a mug of coffee. I wanted to compose you a very small remark so as to say thanks a lot again about the pleasing knowledge you have featured at this time. It was quite wonderfully open-handed with you to supply without restraint exactly what a lot of folks would have marketed as an ebook to get some dough for themselves, primarily considering the fact that you might well have tried it in case you wanted. These secrets also worked to become fantastic way to understand that the rest have similar dreams just as my personal own to learn more on the subject of this condition. I am certain there are many more enjoyable opportunities in the future for many who view your website. I am no longer certain the place you’re getting your information, but great topic. I needs to spend a while learning more or understanding more. Thanks for wonderful info I used to be looking for this info for my mission. Thank you a lot for giving everyone an exceptionally wonderful possiblity to discover important secrets from this site. It can be so nice and full of fun for me and my office colleagues to search your blog really three times in one week to learn the latest guides you will have. And indeed, I’m just at all times fascinated with the gorgeous points served by you. Certain two ideas in this post are surely the most effective we have had. I’m grateful you decided to be sharing this. Feeling blessed!